Included as core cryptlib components are implementations of the most popular encryption and authentication algorithms, AES, Blowfish, CAST, DES, triple DES, IDEA, and RC5 conventional encryption, MD5, RIPEMD-160, SHA-1, and SHA-2 ?hash algorithms, HMAC-MD5, HMAC-SHA1, HMAC-RIPEMD-160, and HMAC-SHA2 MAC algorithms, and Diffie-Hellman, DSA, ECDSA, ECDH, Elgamal, and RSA public-key encryption algorithms. All algorithms, security methods, and data encoding systems in cryptlib either comply with one or more national and international banking and security standards or are implemented and tested to conform to a reference implementation of a particular algorithm or security system. 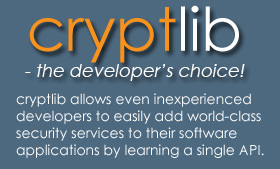 Compliance with national and international security standards is automatically provided when cryptlib is integrated into an application. ANSI X3.92, ANSI X3.106, ANSI X9.9, ANSI X9.17, ANSI X9.30-1, ANSI X9.30-2, ANSI X9.31-1, ANSI X9.42, ANSI X9.52, ANSI X9.55, ANSI X9.57, ANSI X9.62, ANSI X9.63, ANSI X9.73, ETSI TS 101 733, ETSI TS 101 861, ETSI TS 101 862, ETSI TS 102, FIPS PUB 46-2, FIPS PUB 46-3, FIPS PUB 74, FIPS PUB 81, FIPS PUB 113, FIPS PUB 180, FIPS PUB 180-1, FIPS PUB 186, FIPS PUB 198, ISO/IEC 8372, ISO/IEC 8731 ISO/IEC 8732, ISO/IEC 8824/ITU-T X.680, ISO/IEC 8825/ITU-T X.690, ISO/IEC 9797, ISO/IEC 10116, ISO/IEC 10118, ISO/IEC 15782, ITU-T X.842, ITU-TX.843, NSA Suite B, PKCS #1, PKCS #3, PKCS #5, PKCS #7, PKCS #9, PKCS #10, PKCS #11, PKCS #15, RFC 1319, RFC 1320, RFC 1321, RFC 1750, RFC 1991, RFC 2040, RFC 2104, RFC 2144, RFC 2202, RFC 2246, RFC 2268, RFC 2311 (cryptography-related portions), RFC 2312, RFC 2313, RFC 2314, RFC 2315, RFC 2437, RFC 2440, RFC 2459, RFC 2510, RFC 2511, RFC 2528, RFC 2560, RFC 2585, RFC 2630, RFC 2631, RFC 2632, RFC 2633 (cryptography-related portions), RFC 2634, RFC 2785, RFC 2876, RFC 2898, RFC 2984, RFC 2985, RFC 2986, RFC 3039, RFC 3058, RFC 3114, RFC 3126, RFC 3161, RFC 3174, RFC 3183, RFC 3211, RFC 3218, RFC 3261 (cryptography- related portions), RFC 3268, RFC 3274, RFC 3279, RFC 3280, RFC 3281, RFC 3369, RFC 3370, RFC 3447, RFC 3546, RFC 3565, RFC 3739, RFC 3770, RFC 3779, RFC 3851, RFC 3852, RFC 4055, RFC 4086, RFC 4108, RFC 4134, RFC 4210, RFC 4211, RFC 4231, RFC 4250, RFC 4251, RFC 4252, RFC 4253, RFC 4254, RFC 4256, RFC 4262, RFC 4279, RFC 4325, RFC 4334, RFC 4346, RFC 4366, RFC 4387, RFC 4419, RFC 4476, RFC 4648, RFC 4680, RFC 4681, and the Payment Card Industry Data Security Standard (PCI-DSS, cryptography-related portions). In addition cryptlib can be used as an add-on security module to provide security services as per ISO/IEC 62351 for SCADA protocols such as IEC 60870-5, DNP 3.0, IEC 60870-6 (TASE.2 or ICCP), IEC 61850, and IEC 61334 (DLMS).